Oh, two more months to go and you will enter toddler stage na. How time flies so fast. I can still remember the first time I saw you, super cute and ang liit liit mo pa and now look at you, you are getting bigger and beautiful everyday. So what exactly is going with this 10 month old baby girl? Well, I guess you gain another pound this month and another inches tall (Don’t worry honey, we will visit your pedia soon), you are so likot na to the highest level which I think it’s normal. I love watching you how you learn to play with your tongue maybe because of your itchy growing teeth. I’m so proud of you that your body knows how exactly what to do. You know what Rhian, you grasp everything, pati salamin ko di mo na pinatawad, from your toys to the things that are dangerous to hold. Di ko tuloy alam kung kanino ka nagmana ng kalikutan mo. You put everything on your mouth na parang hindi ka pinapakain, you cry so much pag hindi binigay yung gusto mo, but baby you are very good in everything. You are able to hold one thing and pass it from one hand to another and you just smile whenever you did it. You really love to smile, in fact you have the most beautiful smile I ever seen. Pag nag uupload ako sa facebook asahan mo na marami syang likes, because seeing your innocent smile means so much to me, to us. Whenever I see you, I can’t control myself but to cry, because you are the most precious gift that we received from God. Rhian, I Love You! You are my everything. You are exactly the daughter I always hoped to have. I love to embrace you all day, nurse you as long as you want, cuddle you and carry you as long as I can. Thank you for filling our days with so many smiles. I love waking up to your laughter and beaming face each day, feeling your tight hugs, and watching your determination every day. Daddy and I were happy before you came along, but now that we have you, happiness doesn't even touch how we feel. Baby Love, we love you so much and we are so proud to be your parents. 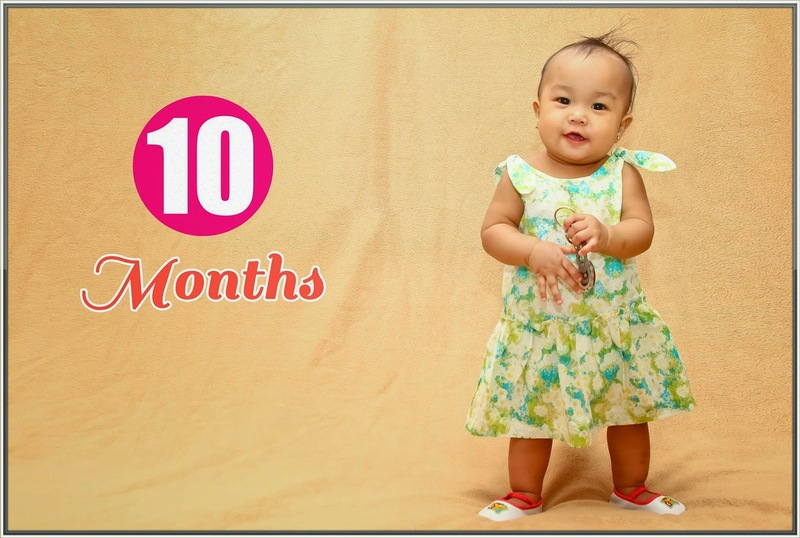 Happy 10th month Baby Rhian.